Privately owned, Lady Katie had restoration completed in 2015 and returned to active dredging. Together with Martha Lewis and Rosie Parks, she is one of the "Three Sisters" built all at the same time by Bronza Parks. 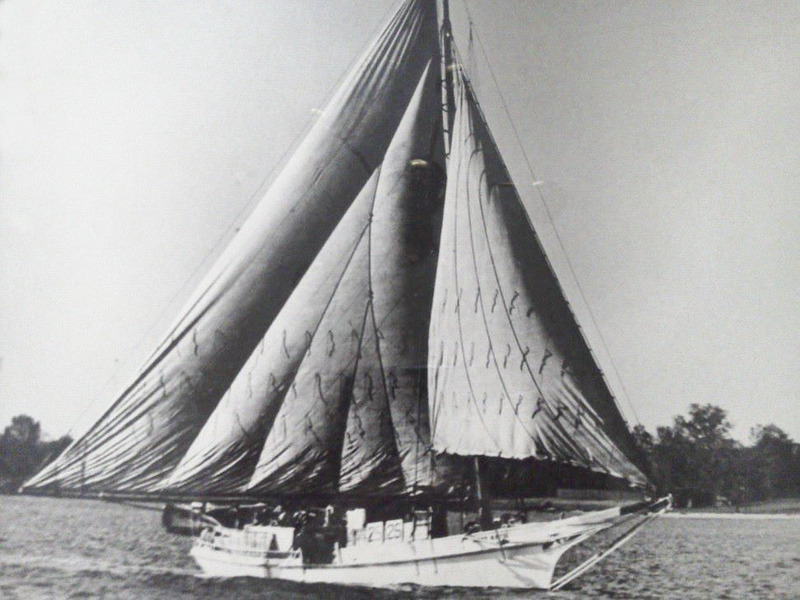 In 1956, Lady Katie was the last launched of famed boatbuilder Bronza Parks' "Three Sisters," three skipjacks, including Rosie Parks, built for his brother Orville, and Martha Lewis, built all at the same time alongside each other. The man who originally commissioned the boat died before the vessel was finished, so Bronza kept Lady Katie for himself. Bronza only enjoyed a couple years of dredging with Lady Katie before he met a violent death in 1958, shot by a disgruntled customer who later was declared mentally ill.
George Powley of Wingate, Maryland, then bought her and enlisted Gene Wheatley as captain. Wheatley had learned to dredge under Bronza's brother Orville Parks on Ida May. Powley is listed as owner in the "Roster of the Famous Skipjack Fleet" for the 1962 race at Solomons, Maryland. Lady Katie's tonnage (cargo capacity) is listed in the roster as 8 tons. Only vessels under 10 tons (burden) were allowed to dredge in Maryland rivers in the early 1900s. Many early skipjacks were listed as under 10 tons in order to work in the rivers. Lady Katie is closer to 18-20 tons (burden). In 1979, Stanley Larrimore bought Lady Katie. Larrimore worked her as a dredge boat for fifteen years. During that time, she had her moment in the spotlight when, in 1984, President Ronald Reagan boarded her at Tilghman Island to speak about the environment and the future of the Chesapeake Bay. Scott Todd had never been aboard Lady Katie when he bought her in 1994 from Larrimore, but he had been admiring the boat since he was a little boy. Scott first saw Lady Katie in Cambridge Creek when Gene Wheatley still sailed her. Scott was about ten years old and with his grandfather, Emerson Todd, who owned Rebecca T. Ruark at the time. Even at that young age, Scott thought she was a pretty boat and how nice it would be to own her one day. "All the watermen from back then would tell you, this was the best one of the three," he said. "Of course, you couldn't say that to Orville." Scott's opportunity arrived one day in the fall of 1994, when he was told that Larrimore was selling the boat. Larrimore already had a buyer in hand, but agreed to wait and talk to Scott first. There were tears in Larrimore's eyes when Scott gave him the check, and Scott figured he would get a call the next day from Stanley wanting the boat back. "Sure enough, about nine the next morning, the phone rang," recalled Scott, "but it was the bank wanting to make sure the check was good. Maybe they were tears of happiness." "When I got the chance to buy her, I snapped it up," he said. "I figured we'd just fix whatever was wrong with her after that." Like most of the commercial skipjacks, Lady Katie had worked hard for a living and was showing her age. Beneath the copper sheathing worn to protect the hull from ice while dredging, there was a hole on the port side big enough for Scott to crawl through. The mast was rotten. Scott knew that at some point the whole boat would have to be replaced. Stopgap repairs kept her going, but "a little at a time wasn't going to cut it," he recalled. It was 2002 when Scott finally hauled her out for the predicted whole-boat restoration. At her subsequent relaunching, he said, "We have built a new boat where the old one was sitting. In a way, though, it's still the same boat. It's pretty much the same boat that I watched as a little boy and grew up and dreamed about." Only about the bottom two-thirds of the keelson was left of the original wood. "I don't know why I kept that," Scott said. "I should have put that in the trash, too." He was careful to keep the design of the boat the same as the original Lady Katie. He has continued to work on her over the years since then as he has had the money to do so, with the help of lots of volunteer labor from friends. It hasn't been easy. "We systematically took her apart and replaced everything with as good or better workmanship," he said. He paid for some of the expert labor needed, but was able to get plenty of materials and local lumber, which he kept to dry for a year in a barn behind his house. The effort became a time and money issue. "From about 2002 to 2010, we kept asking why we were doing this," he recalled, as the oyster harvests dwindled. Still, he kept plugging away, even when his personal life and financial issues got in the way. Referring to the traditional symbol for a boat that has no debt attached to it, he recently said, "There's no gold ball sitting on the top of the mast, but it won't be long now." One fundraising effort he tried was selling decoys made out of the original mast. Noted carver Joey Jobes made them, as he has done for several other skipjacks, including Hilda M. Willing, Kathryn and Nellie L. Byrd. Jobes is the younger brother of Charles Jobes, who made decoys out of Rebecca T. Ruark's mast to raise funds for that boat. Scott said he raised some money from the decoys, but found he preferred instead to give them away to the people who have helped him bring Lady Katie back to life. Lady Katie also had a little help from her sister. The Chesapeake Heritage Conservancy donated an old set of sails from Martha Lewis. Scott built a new mast and boom for Lady Katie, each two feet longer, and a new bowsprit a foot longer, to accommodate Martha's larger sails. "We pumped her up for more horsepower," laughed Scott. Her current trailboards and eagle were carved by Edward R. Thieler III. When the expense and responsibility of ownership has given him second thoughts over the years, Scott occasionally has considered selling Lady Katie. Someone once offered to buy the boat from him and let Scott still sail her. He thought about it for one long night and headed out the next morning in his truck to meet the buyer, with the owner's title on the front seat beside him. He had not gone far before he looked down at that title, with his name on it, and the tears came. "I couldn't see through the windshield," Scott said. "I called him and told him I couldn't sell her. That's just the effect the old boat has on me." With Lady Katie finally back in shape, Scott is putting her back to dredging. 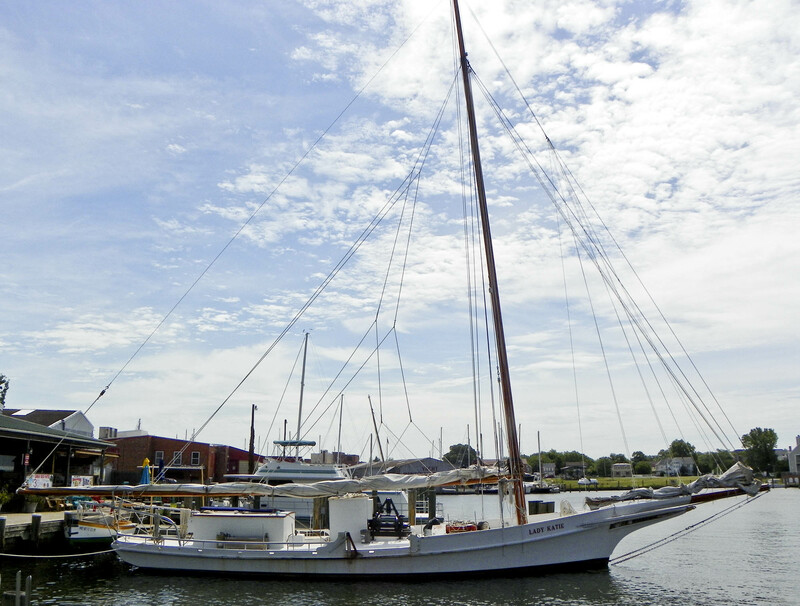 She also sailed in her first skipjack race in many years when she participated in the 2015 Choptank Heritage Skipjack Race in Cambridge. She didn't finish, but after being idled by ongoing renovations in recent years, it was great to see her sailing again.